He is generally shown as to be calm and open minded. In fact, many comparatives can be made between his personality and Yin and Yang, which he appropriately wears the symbol of, the Taijitu. The forces of Yin and Yang are generally described as opposite but complementary forces, and the same can be said about him. He can be calm and collected, but also a fierce competitor. These two qualities can be referred to as opposites, but they are not absolute in their differences, and the same can be said about Yin and Yang. Furthermore, the forces of Yin and Yang are interdependent, meaning that they cannot exist without their counterpart. This can also be compared to Ray's personality. His whole nature seems to be similar in principal to this metaphysical concept. (Season One) Ray is first introduced to the show in episode 6, named Dragoon Storm. In this episode, he is portrayed as a powerful and confident competitor. However, some may say that he is shown as overconfident in some aspects, especially before the battle against Tyson had even begun. In the first battle, Ray easily, and almost effortlessly destroys Tyson's blade using his bit beast Driger's Tiger Claw attack. The following battle, Ray becomes somewhat cocky about his ability, and ends up losing the 2nd round to Tyson. Ray forfeits the final, deciding battle, saying that he had no more to prove. After the final round of the Tournament, between Tyson and Kai, Ray approaches Tyson, along with Max and Mr. Dickenson, inviting him and Kai to join the new BBA team called the Blade Breakers. Throughout the first season, Ray is looked to for advice about battles. He is generally revered as a kind hearted, polite individual, who is very welcoming when meeting new people. 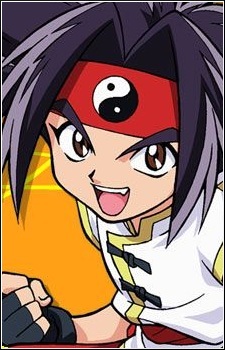 He is also shown as being very open minded, especially about Beyblading techniques. This is emphasised in the Asian tournament, used as a means to justify his leaving of his home village. It is also shown in this season that he has an uncle who is the head chef at a restaurant in Paris, which is owned by Olivers' Dad. It is also shown that he works as a waiter in a restaurant in Hong Kong for extra cash. This has led to an opinion of him loving to cook. (Season Two) Generally, Ray is shown in a similar light as to how he is portrayed in season 1, although in V-Force, he is much more critical of his performance. A good example of Ray's kind hearted nature is shown in V-Force, in the battle against Salima and Cyber Driger. During this battle, Salima becomes somewhat hypocritical towards her original philosophies towards beyblading. Because of this, Ray spends most of the battle trying to convince her that using Cyber Driger has tainted her beliefs. Ray uses three beyblades in the second season--Driger Fang, Driger Vulcan, and Driger Vulcan 2. (Season Three) In this series, Ray is portrayed in a very different way from the other two series. In the previous two, he was shown as being a polite young man, but unconfident in his beyblading ability. In G-Revolution however, he is shown as being confident, almost to the point of being cocky. It is this that causes him to lose some of his matches. During this series, he leaves the Bladebreakers to help form the White Tigers X team, partnering up with his former teammate, Lee. Ray uses three beyblades in this season, the Driger Vulcan 2,the Driger Gatling, and Driger Metal Slash.